Great Tastes Tuesdays! : Sweet and Salty Pretzel Crunch! This recipe is so fun for this holiday season! Take a plate of these to a party and they will go so fast! Your friends and family will also love them. will want to keep coming back for more. You just can't eat one! Enjoy! Turn on your oven at 200 degrees. Place as many pretzels as you would like on a cookie sheet! Place a Rollo on each one of the pretzels. Have your oven on for 10 minutes and then turn it off. At this point you will put your cookie sheet in full of your pretzels and Rollo’s. When your Rollo’s look like they are starting to sweat pull out your cookie sheet and push a pecan down into the chocolate. 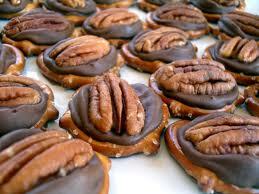 Let them cool and enjoy this salty, chocolaty, nutty, carmel goodness! *Note: You can mix up what you place on top! So if you don't want pecans you can either place another kind of nut on top, do M & M's (Christmas Colors) or be creative with whatever sounds good to you!